Lumiotec, located at Yonezawa City, Japan, was formed in May 2008 by Mitsubishi Heavy Industries, ROHM, Toppan Printing and Mitsui to check the viability of OLED panels for lighting, and to manufacture and sell the panels. In March 2009 Lumiotec showed their first OLED lighting prototype, and the company is now offering panels online - making about 60,000 panels a year. Here's our hands-on review with their Version 1 development kit and square OLED panel and here is some details on Lumitec's technology. In early 2018 V-Technology announced it is set to acquire Lumiotec. A few weeks ago we reported that Lumiotec will start selling OLED Lighting panel dev kits, and today they have indeed opened their online store. The store only accepts Japanese orders currently. The development kits (pictured above) include one 145mm x 145mm OLED panel, a controller and an AC adapter. They cost ¥84,000 each (about $930) a little higher than what they said a couple of weeks ago. Japan's Lumiotec plans to start shipping OLED Lighting panels next month. These will be sample kits that include one 145mm x 145mm OLED panel, a controller and an AC adapter. The kits will cost ¥80,000 each (about $880). Lumiotec plans to increase production capacity in July and reach about 40,000 panels annually. These kits are actually more expensive than the ones offered by Philips or OSRAM (although the OLED panel itself is larger). But at any case these are just 'samples', with real commercial panels expected at around 2013. Lumiotec is showing new OLED lighting panels. 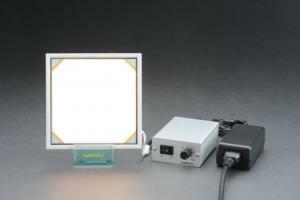 Lumiotec has equipment for developing 300x300 mm OLED panels (although the ones on show are 142x142mm). The panels are 3.5mm thick with a 3800k-4000k color temperature. Lumiotec plans to begin mass-production in January 2010, which is great news. The company is in contact with the big 3 lighting companies - OSRAM, Philis and GE (all of them has independent OLED Lighting programs). 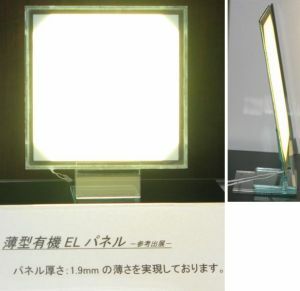 Several companies are exhibiting new OLED lighting panels at the Lighting Fair 2009, in Tokyo. 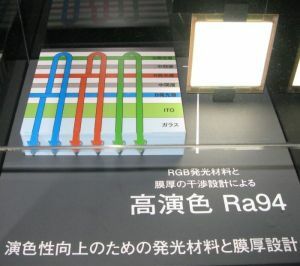 Japan's Research Institute for Organic Electronics (RIOE) showed an OLED panel with 5,000cd/m2 luminance and only 15W power consumption (that's 15lm/W, like a incandescent bulb). They also showed a transparent OLED window (70% transparent). Lumiotec, the Japanese joint-venture, had 1.9mm thick OLED panels on show. They actually plan to start making samples of those devices by fall 2009. Panasonic actually displayed an even thinner panel - only 1mm. They think that OLED lighting will be ready within 2 years, but it will take much longer (10 years) for it to be used main lighting. Philips exhibited their Lumiblade OLED panels. They recently built a new plant in Aachen, Germany, to make those panels. At FPDI, Lumiotec gave some more info on their OLED Lighting products. The panels are only 2.3mm thick, and the has high color rendering properties and a broad spectrum with peaks in red (R), green (G) and blue (B) regions. The company employed a technology called "multi-photon emission (MPE)," which uses several emission layers stacked vertically. The product on display had vertically stacked three emission layers with different emission wavelengths for RGB colors. Lumiotec (a new JV of several Japanese companies) has shown their new lamp prototype at CEATEC. The "Fenalene" is a lamp made from 3 OLED panels. It reportedly has a luminance of 5,500cd/m2 and a life of 10,000 hours.